For the third year in a row, the University of Wisconsin–Madison has been ranked No. 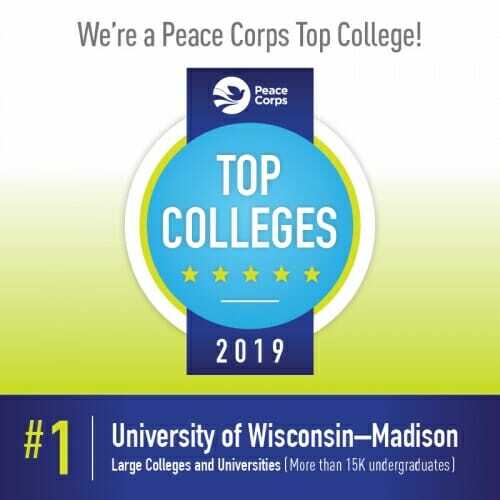 1 among large schools on the Peace Corps’ list of top volunteer-producing colleges and universities in 2019. There are 75 Badgers currently volunteering in countries around the world. UW–Madison has consistently ranked in the Top 5 since 2012. The university is No. 2 for total volunteers since 1961, with nearly 3,300 alumni having served. More than 6,400 Wisconsinites have served as Peace Corps volunteers since the agency’s founding. During a visit to campus last fall, Peace Corps Director Jody Olsen lauded UW–Madison for its work in preparing students to become global citizens. She emphasized that this mindset prepares students for service and allows them to build valuable skills while volunteering. Marissa Glazos, a 2014 graduate who majored in psychology and biology, was drawn to volunteer in the Peace Corps through its prominence at the university and in the community. She is currently a secondary education volunteer in Mongolia. The skills and experiences Peace Corps volunteers gain during their service allow them to thrive in a variety of career fields across numerous sectors, such as government, nonprofit and corporate entities.